Years ago, the term “man cave” would man a dingy, cheerless space with little personality. But these days, it can mean anything to anyone. And it doesn’t have to be just for men—a “man cave” can be about the comfort of a home, entertaining done right, and a space personalized to your needs. So how about it? If you’ve been thinking about turning a space to something you’re thrilled to come home to, speak to a representative at Windows & More here in the Lake Ozark area. We’ll be happy to help you finish out your space as you need! Perhaps you’ve already made the move from the basement to the bachelor pad, but now with a growing family, it’s time to commit to your own creative space. 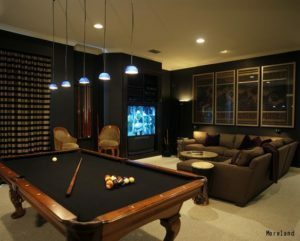 Today’s man cave can be anything from a chic billiards room to a home theater haven with wet bar and wine racks. Find a theme to express your personality and sense of style. And be sure to use your walls to the best by letting your passion show. For example, if you love sports or hunting, display it. Put up a giant TV to show the big game to your family and friends. Hang your memorabilia in flattering spaces and lighting, so that it’s not hidden—it’s out there! Remember that accent lighting can give your collection a dramatic look. Think about the room’s focal point. It could be the furniture, for example. Choose furniture that’s robust, simple, and sturdy. Leather armchairs are a really great example; plus, they’ll add warmth and comfort to your space. Don’t forget to add a comfortable ottoman to rest your feet after a long day. For the windows in the space, Hunter Douglas has the perfect solution to finish the room. If you want to go for a masculine look, consider something like wood shutters or blinds. Plantation shutters are available in wood, faux wood, and polysatin™ compounds. 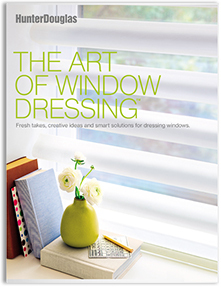 Also, consider Parkland® real wood blinds or, for a more cost-effective solution, look at EverWood®, a faux wood solution. If you want to control light to watch movies or the big game, select a window treatment with true blackout features like honeycomb or roller shades. No matter what, you’ll be able to find a treatment that provides an extra layer of insulation at the window, the privacy you want, and UV protection.